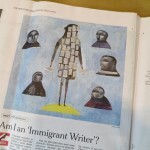 ‘Am I an Immigrant Writer?’ A piece for this past weekend’s The New York Times Sunday Review. Art director, Matt Dorfman. Read the article and see the illustration on The New York Times Opinion Pages blog here.